So yesterday was the first time a stranger has confidently asked me if I was pregnant. I think that’s a good sign that the bump is obvious now. I have definitely had the stares from people who may as well have thought bubbles popping out of their heads saying, “Is that girl pregnant?” I am glad the bump is obvious now. It’s getting exciting. Is Baby Willingham a boy or a girl? Food Cravings: Doughnuts – I still haven’t eaten any this week, but I feel like I’ve seen tons of photos of people eating them back home and I am quite jealous. Maybe I’ll venture out this week and get some! A little insomnia sometimes when I wake up to go to the bathroom in the middle of the night. I have a bit of a hard time falling back asleep. I have read that this will only get worse…good thing I have a bunch of books to read! 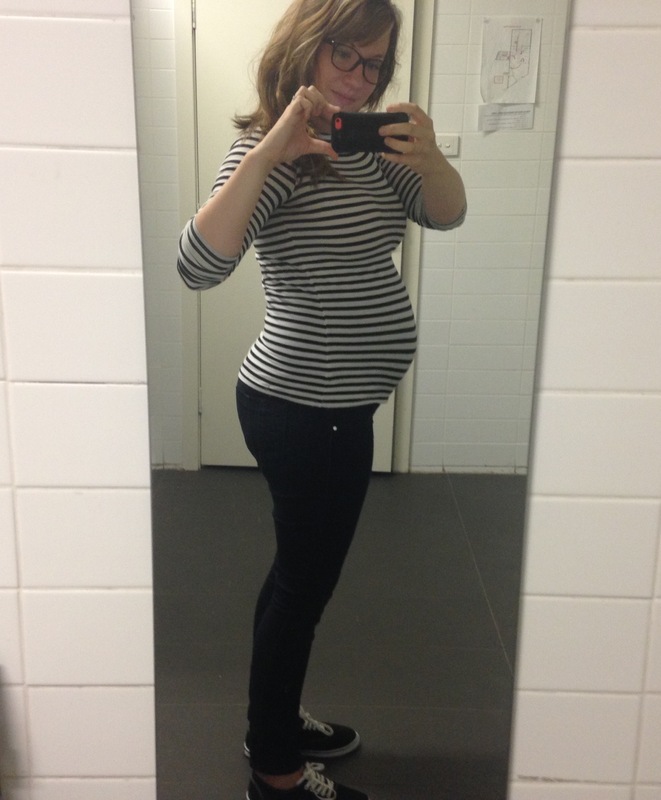 New this week: On Monday I went in for my Glucose Tolerance Test. I feel like this test is somewhat like childbirth – everyone has so much to say about it, and it can often create fear. Obviously I haven’t experienced childbirth yet, so I can’t really comment on that. However, the glucose tolerance test was more annoying than horrible. The drink wasn’t a cappuccino or anything equally tasty, but it certainly wasn’t the worst thing I have ever tasted in my life. It was like too sweet cordial or Kool-aid. You have to wait around, sure, but if you bring a pal (husband!) or a book, you’ll get through. All that to say, it was not nearly as bad as people say it is, and I got through it. At my midwife appt, my midwife said all my levels were normal, so done and dusted! Also on Monday, I got a call about my referral getting through to the Midwives, and they asked if I could come in for my first appointment “tomorrow”. I think I mentioned this on Friday, too, so I won’t drag out this story. They got their dates mixed up, and they meant Wednesday. On Wednesday, I went for my appointment, and it was great. The midwife was super sweet, and we just chatted for awhile. She asked me tons of questions for my record and sent me with a bunch of little booklets and such. It was informative and helpful. She sent my referral to the specific midwife team that I had wanted, so hopefully I will hear from whoever will be my particular midwife in the next week or two. Here in Newcastle there are 4 basic options for giving birth – in the delivery suite with an obstetrician, with the midwife team in the birth centre at the hospital, with the birth centre team (midwives) at the birth centre at the hospital or with midwives at Belmont, which is about 15 minutes from the hospital. I knew I wanted to go with midwives, and since there were three options, I looked for a bit more understanding of them all. I was attracted to Belmont because you stay with the same midwife the entire time, they’re very low intervention and they have great outcomes. Being 15 minutes from the hospital made me a little nervous, though. My friend went with the Birth Centre team, which is very similar in the model of care to Belmont- you get the same midwife the whole time, low intervention, etc, but it’s at the hospital. The Birth Centre team is relatively newer as far as the setup goes. That’s what I have been referred to. I think the initial appointment was to assess how I was going and whether or not my pregnancy is low-risk, which is the only way you can go with midwives from what I understand. I am very thankful to be low-risk and to get to go with this model of care! Looking forward to: Our first birth and parenting class is tomorrow! I am also looking forward to meeting my midwife and getting to know her. Exercise: I had some breakthrough finally! I found a prenatal pilates video that has 5 parts that are 10 minutes each. The different focuses are standing, core, buns and thighs, total body and flexibility, and the girl who is instructing was 36 weeks when she filmed! WOW! I started that this week, and it felt SO good. I have a little schedule for myself. You can do all 5 together for a longer workout, or you can do one or two here and there. I have my schedule set to do one every other day and two on the alternating days so I am getting something in each day. Hoping to improve my lack of consistency so far this pregnancy, particularly by remembering how good it felt! Plus, still walking when I can!